Pack your bags for 9 days in Umbria! Castles, olive groves, vineyards, medieval architecture, truffle hunting, 4-star hotels, cooking class, shopping, eating and drinking! 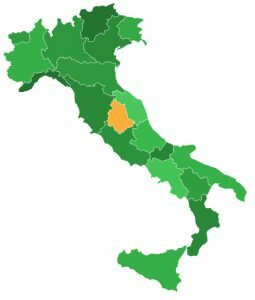 One of Italy’s smallest regions, Umbria lies in the shadow of its more illustrious neighbor, Tuscany. With fewer tourists, its cities have remained more authentic and less pretentious. Dubbed Italy’s “green heart,” this beautiful region is a land whose rolling hills are dotted with castles, fortresses, olive groves and vineyards, whose well-preserved hill towns produce world-renowned handmade ceramics, whose valleys are laced with countless gleaming rivers and host Italy’s largest lake. In Umbria, halfway up the slopes of Monte Fumaiolo, a trickle seeps out of the ground and wanders southward, gaining breadth and notoriety to become Rome’s mighty Tiber. Any traveler who goes from Florence to Rome by land passes through the Tiber Valley, whose Umbrian locales include such towns as Assisi, Perugia and Orvieto. Here is your chance for an unforgettable culinary tour of this unique region of Italy. We will visit excellent, traditional Umbrian restaurants, and at our meals together you will enjoy specialties made from local, fresh, in-season ingredients and local wine pairings. Behind the scenes visits to small scale farms and food makers will give you an intimate look at local cuisine and artistry. We will visit truffle hunters, olive oil producers, wine makers and more. One day we will accompany a professional chef on a trip to the market, followed by a hands-on cooking class with him as we prepare a multi-course traditional Umbrian meal together. Our tour includes private bus transportation, luxury 4-star hotel stays, tours of Umbria, gourmet meals and the chance to experience the cuisine of this unique Italian region and go behind the scenes to see and taste the foods of Umbria at the source. Deposit is due by May 25, 2019! Arrival at Roma Fiumicino Airport. Our guide Gioacchino will pick you up in our private van and bring you to Hotel Relais Metelli in an ancient building in the old town centre of Foligno. This 4-star hotel is located in a quiet area, surrounded by elegant gardens. After check in, relax at the hotel or explore the nearby boutiques, restaurants and bars. At 8 pm we will have our first group dinner at Villa Roncalli. *Please send flight information to info@nancykellys.com so we can arrange transportation from airport for you. Due to time difference, all flights should be made 1 day prior to itinerary start date. Breakfast at Hotel Relais Metelli. After breakfast we will drive to the lively medieval walled hill town of Perugia where we will enjoy a guided tour, followed by free time and lunch on our own. After lunch we will return to our hotel, then take a short drive to Bevagna. 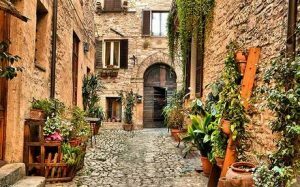 Enjoy strolling the ancient streets of this historic Umbrian town until we gather for dinner at Restaurant delle Mura, then back to Hotel Relais Metelli. Breakfast at Hotel Relais Metelli. 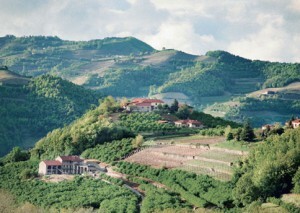 Today we visit Frantoio Petese, an organic olive farm and olive oil producer since 1750! Here we will have a tour and tasting lunch. We return to Foligno for a free afternoon and dinner on your own. Breakfast at Hotel Relais Metelli, then check out. After a short drive, we will enjoy a guided tour of the charming medieval hill town of Assisi. Enjoy some free time after the tour and lunch on your own. In the afternoon we move on to Gubbio and check in at Park Hotel Ai Cappucini. Relax in this luxurious restored 17th century monastery until our dinner at Taverna del Lupo. Breakfast at Park Hotel Ai Cappucini. Umbria is famous for its truffles and today we will see a truffle hunting demonstration and enjoy a tasting lunch at Villamagna Palazzo. Relax back at our hotel before enjoying a walking tour of Gubbio, the most ancient of the Umbrian hill towns, perched on the steep slopes of Monte Ingino. Dinner tonight is on your own. Breakfast at Park Hotel Ai Cappucini. This morning we drive to Umbertide for a visit and tasting lunch at Blasi Winery, a truly enchanting place blending old and new, with a wine cellar dating back to 1742. After returning to our hotel we will take part in a cooking class, preparing a traditional Umbrian meal at Nicolao Restaurant in the hotel. Breakfast at Park Hotel Ai Cappucini. Today we leave Gubbio and travel to Orvieto – one of the most striking, memorable and enjoyable towns in central Italy. Spend the morning exploring and lunching on your own. From here we will drive on to Rome and check in to the Hotel Duca D’Alba – a lovely boutique hotel within walking distance of the Colosseum and Roman Forum. It sits on a narrow, cobblestone street in Monti, one of Rome’s oldest neighborhoods, surrounded by restaurants, shops, and nightclubs. Dinner on your own in Rome. Breakfast at Hotel Duca D’Alba. Today is a guided tour of Rome! After the tour you will have plenty of free time for exploring and lunch on your own. Tonight is our farewell dinner! Breakfast at Hotel Duca D’Alba.After breakfast we leave for Roma Fiumicino Airport and say our goodbyes! 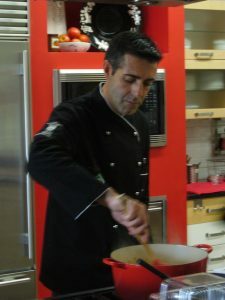 Nancy and her guests will be joined by guide and co-owner of aTTavola, Gioacchino Passalacqua, an artisanal Italian food exporter, gastronome and native Sicilian who divides his time between Sicily, Italy and New York. As a native Italian, Gioacchino has developed relationships with food producers, restaurateurs, olive oil companies, chocolatiers, vintners and confectioners.